This vibrant city's unique locations are a big draw for event planners. 8am: Start the day with breakfast at the five-star Das Stue Hotel, which opens this summer. It boasts 80 bedrooms and two restaurants. Johann-Henrik Winner, Banks Sadler country director for Germany, says: "It has been built in the former Danish Embassy and has interesting architecture, with an overview of Tiergarten, the oldest park in Berlin." 9am: If meetings are the order of the day, travel to Kunztschule, a modern and spacious event space near Checkpoint Charlie. The building can cater for 100 delegates for a conference and has a courtyard capable of hosting 200. 12.30pm: Travel to the Dressler Restaurant, Kurfurstendamm, where up to 125 can enjoy a traditional German lunch. 2.30pm: Treat guests to a four-hour tour of the city on a Segway, taking in sights such as the Brandenburg Gate and Berlin Wall. City Segway Tours Berlin can cater for groups of up to 32, with multiple guides. Vicky Pratt, senior sales and marketing executive at Universal World Events, says: "This is a great way to see all the city sights while having a fabulous time on this most modern method of transportation." 6.30pm: Freshen up at the hotel before dinner at the Nordbahnhof Two Buddhas restaurant, which seats up to 230 people in its 400m2 space. Warren Hillier, divisional director at Grass Roots, says: "The building, in the centre of Berlin, is a former rail station and offers a unique backdrop for the restaurant, which has an Asian-style interior with two koi pools. It is a great event location with the latest lighting-and-sound system, a bar, smoking lounge and large sun terrace." 10.30pm: For delegates who do not want the evening to end, move on to the Felix Club Restaurant for drinks and dancing, suggests Simon Brown, account director at Motivaction. "If you want to impress, this delivers," he says. The venue can hold 350 for a party. 9am: After breakfast, visit Filmpark Babelsberg theme park, where delegates can fulfil their dreams of being an action hero. From fire stunts to dagger-fighting techniques, six stuntmen are available for groups of up to 30 people. Tours of the film sets are recommended. 1.30pm: Treat delegates to lunch at the Michelin-starred Vau restaurant, in the centre of Berlin, to enjoy French cuisine. It can cater for up to 90 diners. 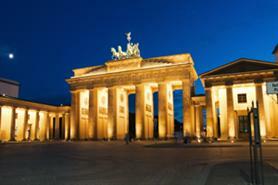 3.30pm: Take delegates on a river cruise along Berlin's stunning canals. Berlin City Tours can host 407 people on its Paris boat, providing a different perspective on the city's sights. 6.30pm: Prepare for a gala dinner at the Berlin Gasometer venue, which holds 200 people for dinner. Grass Roots' Hillier says: "The Gasometer is the only viewpoint of its height in the city without windows or any kind of barrier, giving a direct view of the sky above."